Seventh Annual TCMF Kicks Off! 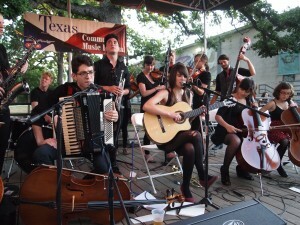 Austin — The Seventh Annual Texas Community Music Festival opened Saturday at Central Market with outstanding performances and delighted music lovers of all ages. For the second year in the row, TCMF’s first headliner was the incredibly talented Mother Falcon, who played into the night for an overflow crowd; possibly the largest single performance attendance in TCMF history. The festival was kicked off by TCMF host band, the Austin Civic Wind Ensemble, which brought its largest contingent to Central Market, upwards of 70 musicians! Following ACWE, the Chaparral Dixielanders got the audience dancing and the swinging continued with the Austin Banjo Club. The Austin Jazz Workshop, a perennial TCMF favorite, presented its 2011-2012 jazz program, the music of Miles Davis. The program continued with a beautiful acoustic / vocal set by John Wilson and Friends and a jumping set of Parisian-style Gypsy Jazz from Hot Club Soda. A special highlight of the first day’s activities was provided by singer-songwriter Debra Jo Johnson, who performed throughout the day on the Cafe deck. Debra became the farthest-travelled performer in TCMF history, driving in from Frankston, in deep East Texas to participate in the festival. TCMF continues Sunday at 11am with the Austin Brass Band and continues throughout the day at Central Market North, with shows Monday and Tuesday evening, also at Central Market North. The program shifts on Wednesday to the Park at the Triangle before returning to Central Market Saturday, April 28. Consult the schedule for a full listing of performances and performers. The Texas Community Music Festival is presented by Strait Music Company and HEB, and hosted by Central Market and the Austin Civic Wind Ensemble.